Spa Marvel is now at America’s SPA-MART! There are a lot of benefits attributed to If you are chemically intolerant to traditional spa treatments that cause rashes, itching or respiratory reactions, or you have trouble getting the chemicals in your hot tub “just right” on a daily or weekly basis, Spa Marvel is EXACTLY what you need. It even allows you travel for days, weeks or months at a time without the worry of keeping up regular chemical spa maintenance! 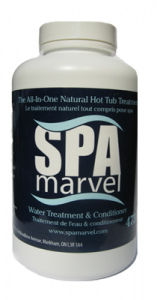 To treat your tub (up to 500 gallons – 2000 liters) just put one bottle of Spa Marvel in the water. It will last 3 months when used on a regular basis. Then after the initial application of Spa Marvel to your water, all you have to do is add another bottle every three months and you could go a year without having to change your water…pretty cool. Of course you can change the water as often as you would like, but it is not necessary. The key to this marvel is the concept of using plant extract for the enzymes that actually remove the food and organic matter on which the bacteria live. This process is how some lakes and large aquariums are maintained without using large amount of caustic chemicals like chlorine and bromine. Let’s look at this process a different way: Bacteria is what causes the cavities in your teeth. It happens like this: The food you eat combines with your saliva and that makes sugar that sticks to your teeth. This sugar is the food the bacteria needs to keep living. When you remove the bacteria’s food source (the sugar) the bacteria will die and you will not get cavities. Instead of brushing your teeth you could rinse your mouth with chlorine to kill the bacteria, but is not practical or safe. So essentially, Spa Marvel is a major factor in removing the food bacteria needs to live in your tub by using plant extracted enzymes. Spa Marvel is not a sanitizer so it is important to use a little bit of chlorine (we recommend a tsp per bather) each time you use your spa. Unfortunately for those of you looking for a completely chemical-free hot tub, there is no safe water care program that doesn’t include at least a small regimen of a fast-acting sanitizer. Prevents scale buildup from occurring, so that you don’t need to use stain and scale control products. Descales deep-seated buildup that can accumulate over time from regular use, especially in hard-water areas, resulting in stronger jets, quieter pumps, more efficient heaters and overall greater longevity of your equipment. Scum and hard-water rings are prevented from occurring around the edge of the tub. Foam is eliminated in a few hours, so you don’t need defoaming agents. No odor, so you won’t need to shower, or want to when you get out of the tub. Has natural skin moisturizing conditioners that soften skin. People with eczema and psoriasis love using Spa Marvel as it actually improves their condition, they don’t have to use expensive medicated creams, and it will not irritate and dry out your skin the way the chemicals will. Of course, Spa Marvel is well-suited for all hot tubs and conventional spa treatment systems including ionizors, ultraviolet, ozonators, bromine, chlorine, salt systems and lithium. Rarely, the biguanide products, when used with Spa Marvel will turn the water yellow. If this occurs, contact the Spa Marvel customer support team for assistance at 1-888-400-1772 or at info@spamarvel.com. Also, in atypical situations, Sundance Spas’ and Jacuzzi’s MicroClean disposable filters will not perform correctly with Spa Marvel Water Treatment & Conditioner. Our natural sequestering enzymes will do such a great job they cause contaminants in the tub water to clog the filters, and consequently the water will be cloudy. This is the same reason that conventional water clarifiers are not recommended for use with these types of filters. If you encounter water quality issues when using a MicrolClean filter, please contact our customer support team for assistance at 1-888-400-1772 or at info@spamarvel.com. In these situations the use of a replacement cartridge that does not utilize the MicroClean component may be necessary, and is available from your professional spa store. The Spa Marvel water treatment system is similar in annual cost to conventional spa-water treatment products but doesn’t have the hassle. SPA-MART sells the Spa Marvel Water Treatment and Conditioner for $54.99, both the Spa Marvel Cleanser and Spa Marvel Filter Cleaner for $27.99 each. For those customers looking to get all three, we are offering the Spa Marvel Value Pack in which you receive the Filter Cleaner 50% off, a savings of $14. All Spa Marvel products are unconditionally guaranteed, which simply means that if you do not continue using Spa Marvel brand products for any reason you are entitled to a 100% refund of your purchase price. Check out this video with some current users of Spa Marvel talking about their experiences. This entry was posted in Spa Water Care and tagged 00SM8001, 00SM8005, 00SM8009, 00SM8501, New Products, Spa Marvel on July 20, 2013 by admin.